Before Sudoku. 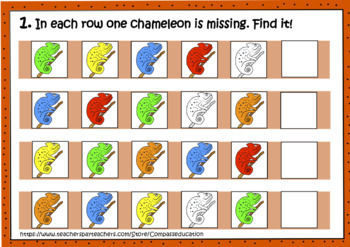 Chameleon: What is missing? Logic set. Sudoku is an engaging puzzle that promotes logical thinking and demands attention to detail. However original Sudoku and even children versions are too complicated for beginners. 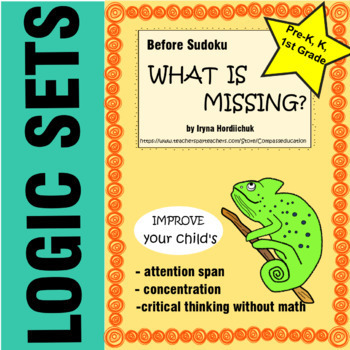 This activity is great for introducing your students to Sudoku. Children have chameleons of six different colors. But one is missing in each row. So kids must concentrate and find a runaway. 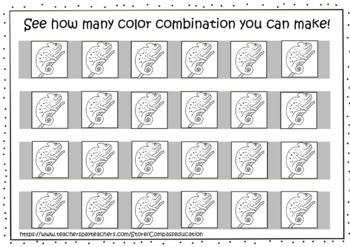 This activity contains six different versions of task and bonus B/W page to color. 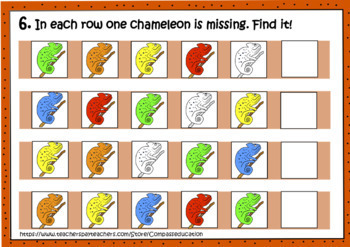 Ask your students to find out how many different ways can these chameleons be colored in a row. Use this resource for early finishers, brain breaks, morning work. This resource develops attention span in children, logic, and critical thinking skill.